Yee-haw! 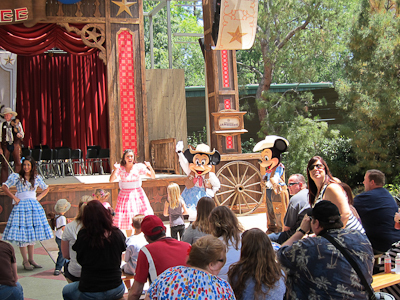 It’s time to mosey on over to the back of the park–no, not Toon Town, the other back of the park–for a round-up Jamboree (speaking of which, I haven’t done a Search Engine Roundup in a while, have I?). 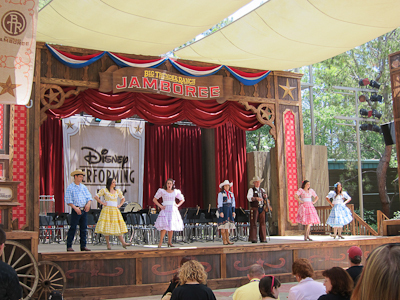 So back behind Big Thunder Ranch there’s a big space with a stage. There used to be a Hunchback of Notre Dame stage thing there at one point, but I never saw it. 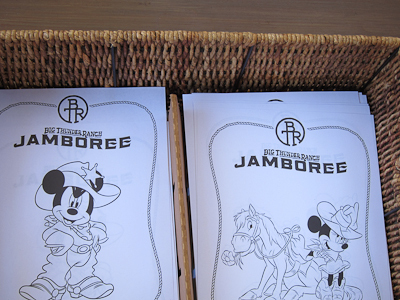 Well, it’s got a new thing now, and that new thing is the Big Thunder Ranch Jamboree! 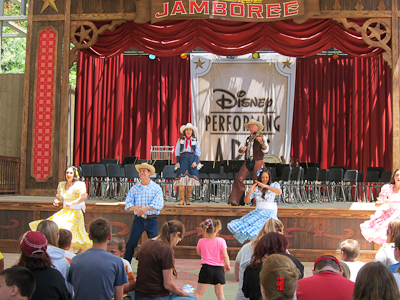 The Jamboree consists of three different things: character meet and greet, interesting booths and stuff for kids to do, and performances. The character meet and greet is what initially drew me back there. 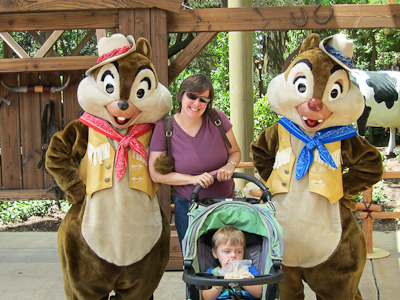 Actually I say “initially drew me back there” because I had heard of this Jamboree thing but hadn’t been over to check it out or anything, and then I get this Facebook message from my friend Kristin, who was like “OMG DID YOU KNOW THERE ARE CHARACTERS ALL OVER THE PLACE FOR PICTURES WITH NO LINES AND IT’S SOMEWHERE BACK BEHIND THE COWS AND STUFF?? ?” Not a direct quote, but that was the gist. And I thought oh yeah, that’s what the Jamboree is! 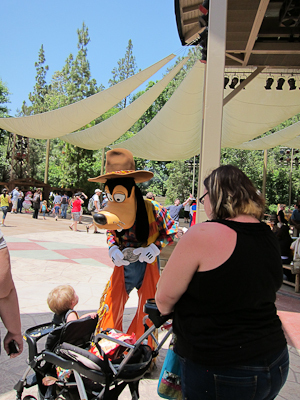 Theo was so uninterested in taking a picture with Goofy that he wouldn’t even let me put the stroller up next to him, so here’s someone else’s kid interacting with Goofy. 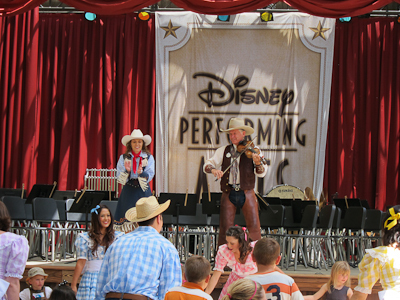 There were a bunch of characters there, all dressed in Western outfits–even Clarabelle the cow and Horace the horse. 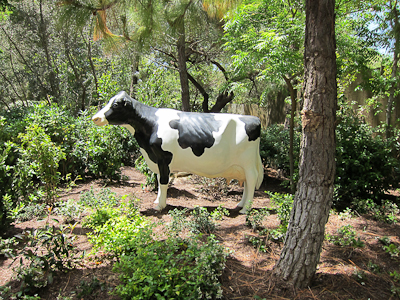 While Theo couldn’t be bothered to post for a picture with the characters, he was completely enchanted by this stationary fake cow in the bushes. He found it so fascinating I felt obliged to take a picture of it. 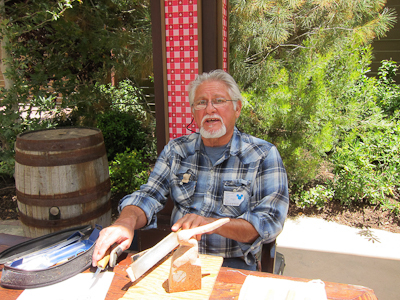 There were booths of traditional Western-type crafts and such. 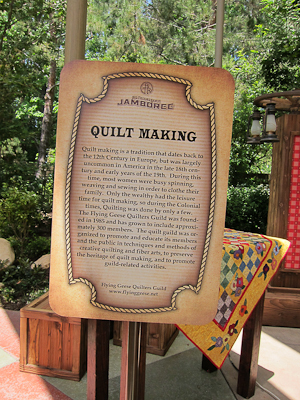 For example, quiltmaking. 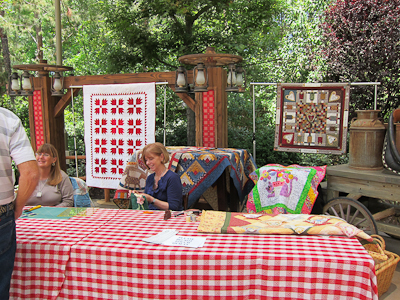 My mother in law is a fabulous quilter, by the way. Theo really liked the wood carver. 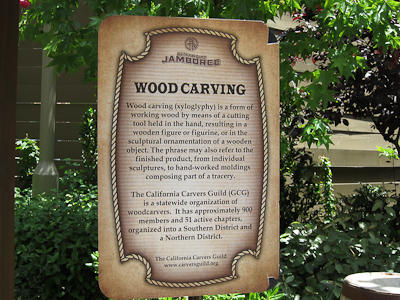 They had a Real Live Woodcarver there, and he was really a nice guy. 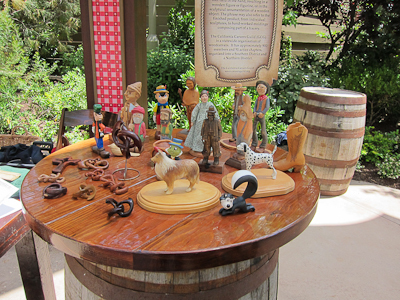 His table of carvings was impressive. Unfortunately, none were for sale. The Disney characters were awesome! And look! There’s a Pinocchio! Heh. 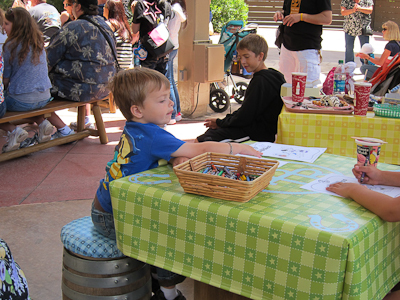 You could just pick up your free coloring sheet and the little tables had baskets of crayons. The best part was the performance. The dancers grabbed willing audience participants to do a little country dancing. It’s Mickey and Minnie, y’all! 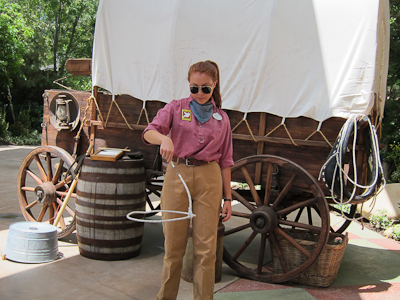 Right now the Big Thunder Ranch Jamboree is on Fridays, Saturdays, and Sundays, and I believe in the summer season you’ll find it every day. Check your daily entertainment guide!